NO plinth (or other indication that there was a failed attempt to create the “C” in my head’s casting). The CSN on my head is RH585, while Rob’s head(WITH cast-in “C”) is RHB527, seeming to indicate my head is indeed a much earlier casting…6 characters vs only 5. Perhaps there WAS no screw-up in casting after all, just a “lost” bin of heads, later “found”, finished and installed many months later than the CSN would otherwise indicate? And kudos to both Roger and Sroope for delving into this so whole-heartedly! The lost batch theory has an even simpler explanation. Fork lift drivers. I imagine at West Yorkshire they had a pattern for making heads two at a time. Very common for a long slender thing like a head. We made railcar couplers two at a time because the copes and drags were square. The letter C falls off one side and nobody notices for a whole shift. Heads are stacked up 6 or 12 on a pallet. A truckload might be 20-30 pallets. The WY forklift driver loads them in no particular order. The Jaguar forklift driver unloads them in no particular order, and maybe stacks them in a corner, first pallet in is the last pallet out. The guy loading them into the machining line takes them last in first loaded. The valve assemblers also don’t trouble to keep them in any order. Thus one shift’s worth of non-letter-C heads from WY is spread over 2 or 3 weeks work at Jaguar. I forgot to mention another reason for loose sand clumps is that molders often take an awl and poke vent holes through the sand in the cope as it is lifted off the pattern, usually in pockets where they want to be sure the poured metal will fill the pocket. It makes a whisker on the casting which is cut or ground off later along with the pouring sprue. Oops big time - and thanks Simon for raising clarification - I should refer to my records rather than try to memorise! The identified batch of castings without the ‘C’ is simply one batch amongst many that did not yet include the ‘C’ addition. As pointed out this anomalous batch of heads-without-C with later-than-expected Engine Numbers in the G53xx-8S to G58xx-8S range, all still have a CSN within the RH4xx to RH5xx range, and that is still amongst the earlier period of all C-type/C3 head castings still not having the added ‘C’. Once the heads are finished, they are then again stored/batched before allocated to a specific Engine Build and thus a specific Engine Number allocation/stamping, thus a second point of batch mixing of CSN initial strict order to now a more scrambled ENGINE NUMBER order. But our ‘anomalous’ batch without the ‘C’ have all ended up with Engine Numbers in the G53xx-8S to G58xx-8S range (with again the caution, this is a guide only, as there are other influencing factors). So the issue is a now-recognised temporarily lost/misplaced batch of early C7707/C3 castings, being delayed in being machined/assembled, and thus delayed in having an Engine Number allocation and assignment to a specific Chassis Number XK140. Its not a casting mistake/error of losing the ‘C’ die. You would have to assume the misplaced/out-of-order batch was an error/omission in the Jaguar warehouse thus an internal mistake, as if it was a delayed delivery from the foundry, the lack of having the ‘C’ would have been grounds to reject the delivery. Sounds like mystery solved!..well done, gents. Hi Wes, Phil Benvin here. I remember meeting you in John Smalleys shed in Nelson, New Zealand. I have a Pastel Blue XK140 FHC. What a riot! I was just thinking about John the other day. What a great guy! I am so glad you said something. Here is my personal email. Please write I would love to chat. I bet there is a familiar looking FHC hiding in this photo from 2006. 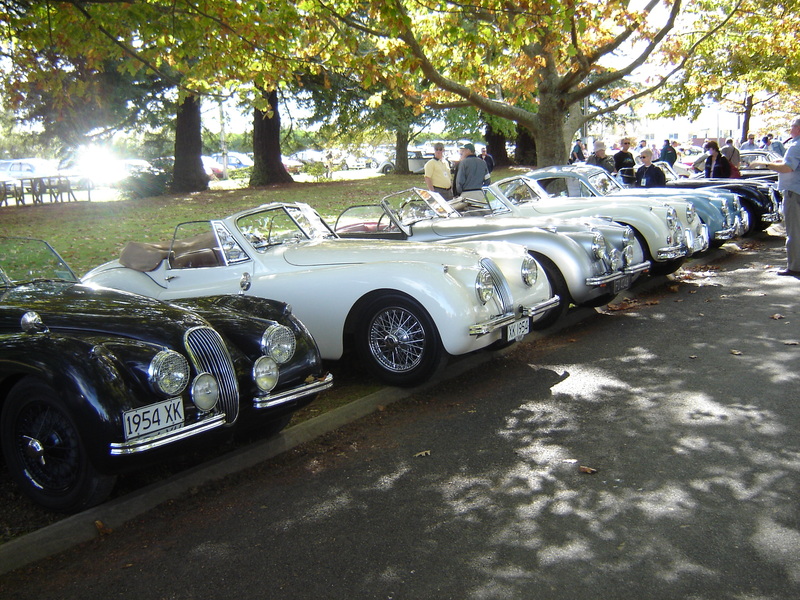 There sure is, my XK140 FHC, at the NZ National Rally in Nelson, my home town. Just to confirm - the C-type head I have which does NOT have a cast ‘C’ in the valley is BE470, engine number G5713-8S. It is a C7707 head. That is very close to my BE475, G5752-8S head…C7707 C 3. On the underside of your head, there are as cast fields that overlap the machined head gasket area. On the inlet side, at the very front there will be a cast overlapping WYF logo (logo denotes the foundry - West Yorkshire Foundry) and alongside that will be the cast CSN, commencing with the letter ‘Rxxxx’. The actual number tells me, approximately when your cylinder head was actually cast, before being delivered to the Jaguar factory for machining and assembly. The earliest C7707 heads did not include the large cast ‘C’ in the middle of the spark-plug valley. 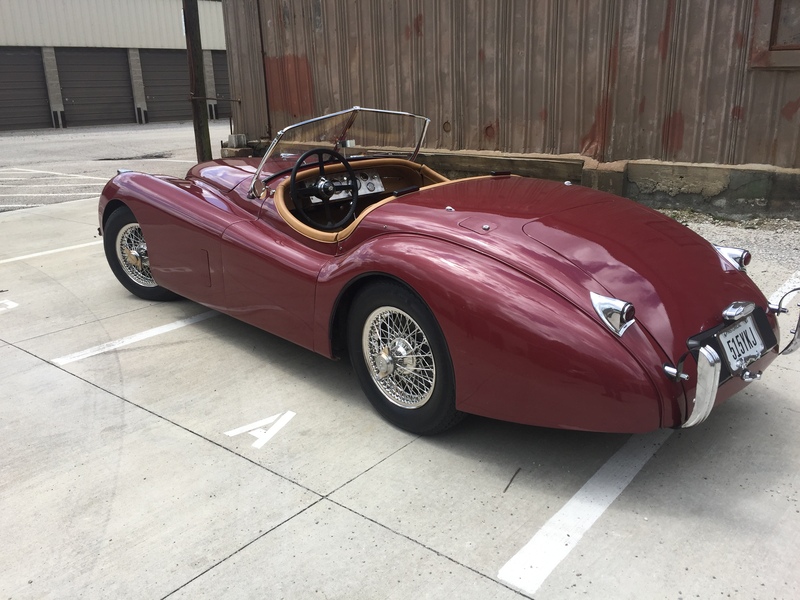 There was a batch of castings, that for reasons unknown, were delayed in being machined and being allocated an Engine Number and then allocated to a particular XK140. Lee’s G5752-8S is a confirmed example, of one from this batch of delayed castings, but I record several others. If its not, there is another explanation, albeit far far rarer. Thanks Roger, I’ll flip it over tomorrow and let you know what I find! The head on my car currently is RHC195 - have I read that right? IIRC, my CSN is RH 585…there is a picture posted within this thread. RH496 is most definitely within the expected range of CSN for this batch of C7707 head castings without the large cast ‘C’, that were delayed in entering the Jaguar machine shop, thus finally getting a later than expected Head Sequence Number (HSN) as per your BE470 and thus a later than expected Engine Number, as per your G5713-8S. But have I missed something - your advised RHC195 is a much later C7707 casting (after RH1 > RH999, numbering continued RHA1 > RHA999, RHB1 > RHB999 then RHC1 > about RHC750) , before the revised C7707-1 casting was introduced. What’s this second head from, and do you have HSN and Engine Number. This is the head for the car I’m restoring, a June ‘55 140 DHC. Engine number is G 3736-8S, the head is BA363 with CSN RHC195. 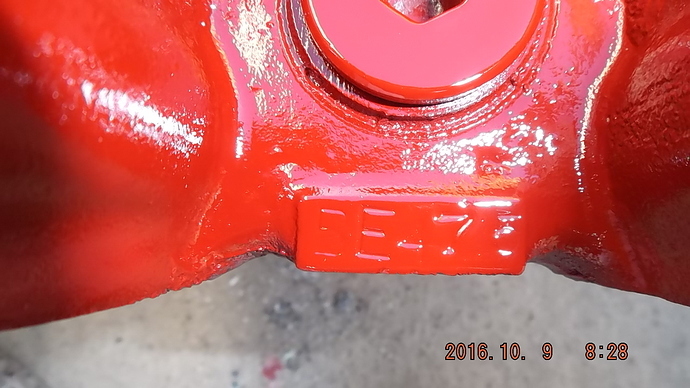 Head and block numbers match and are correct according to the JDHT. Hello, Gentlemen. I’m fairly new to this forum so I hope this is a correct place to ask this question. I have a '52 120 OTS that’s been in my family since 1967. My dad converted it to SBC power when he got it so the original engine is long gone. I do still have the original trans though. Along the way Dad purchased what was supposed to be a “C type” engine with an automatic trans mounted. 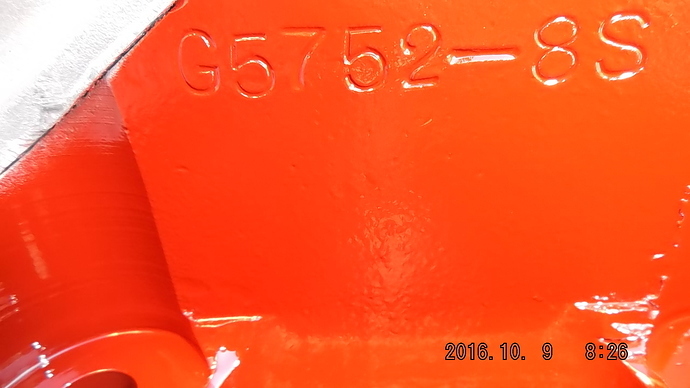 the cylinder head number is G-7534-8S. I only see traces of red paint. The cam covers do have C type badges affixed. So I’m not sure if it’s a “C” engine or not? I am considering a rebuild for the engine to return my car to Jag power or possibly selling the car and substantial stash of parts. I’m located in Mason Ohio (just north of Cincinnati). Does it sound like this may be a real C type" engine and would that be a suitable replacement in my car? I converted to MWS stainless wire wheels two years ago.